Charles A Platt (1861-1933) designed the stately Neo-Georgian Roosevelt House, completed in 1908, on a double-lot on the north side of 65th Street between Park and Madison avenues. Platt had started his career as a painter and landscape designer and then added architectural work, designing numerous large country houses, colleges, and museums, such as the Freer Gallery in Washington D.C. 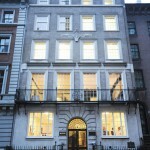 In New York City he was known both for town houses, such as 125 East 65th Street – now the China Institute – and apartment houses, such as the studio building at 131-135 East 66th Street. Platt chose buff-colored brick and limestone for the unified facade of the Roosevelt house which contained two mirror-image residences with a single entrance. Each unit was six stories with a basement and cellar as well as an elevator. Each first floor had its own front reception room with a welcoming fireplace and a rear dining room. The second floors had libraries and drawing rooms. The family bedrooms were on the third and fourth floors while the fifth and sixth floors provided housing for family employees as well as work spaces. An unusual feature was that the family could open pocket doors between the dining rooms and the drawing rooms to connect the spaces. An additional door on the fourth floor allowed family members to go from one unit to the other. 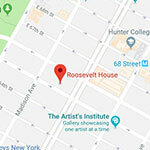 After Hunter College acquired Roosevelt House in 1942, no changes were made to the exterior of the building and only a few interior changes were made, mostly to comply with New York City building codes for public facilities and to meet the needs of the college. Thus, the historic floor plan was substantially preserved. The house became a New York City landmark in 1973 and was placed on the National Register of Historic Places in 1980.